I want to share my passion and experience as a chess player with my students, and through this magical game they will develop self esteem, improve cognitive skills and learn about life. 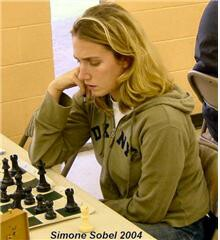 Simone Sobel was taught the game of chess by her father on one evening at the age of fifteen. This very first evening she gave her father "a game" and her talent and passion were immediately obvious. Her parents founds a chess coach (International Master Larry Evans) who guided her rapidly into playing competitive chess. Within a few years she was ranked on the top 50 US women’s list, placing highly in many United States Chess Federation tournaments. In the years following while pursuing her Degree in Journalism, ,she continued to play as actively as she could. She was mentored along the way by various coaches. Her most thrilling experience was to spend ten private days in intensive study with three times Woman's World Champion Susan Polgar. While she actively continues to pursue her own ambitious goals as a chess player, she is eager to share her knowledge, insight, and passion with students of all ages and levels.